Caroline Marcum thought she’d escaped the great mistake of her life by leaving Wellfleet harbor, but is forced to face it when she returns, reluctantly, to care for her dying mother. Ridley Neal put his past-and his prison term-behind him to return home to take over his father’s oyster and clam beds. Casual acquaintances long ago, when a nor’easter hits the coast, Rid and Caroline’s lives intersect once again. When Rid and two other sea farmers are sued by the wealthy owners of vacation homes who want to shut them down, and Caroline accidentally meets the person she most wronged, they each must learn to trust-and love. 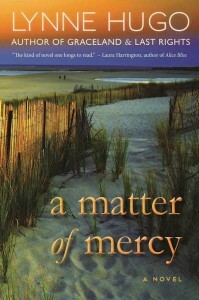 Inspired by a 1996 lawsuit, A Matter of Mercy is a riveting novel about treasuring the traditional way of life in the shallows of beautiful Cape Cod bay by discovering where forgiveness ends. And where it begins. Lynne Hugo is a National Endowment for the Arts Fellowship recipient who has also received grants from the Ohio Arts Council and the Kentucky Foundation for Women. 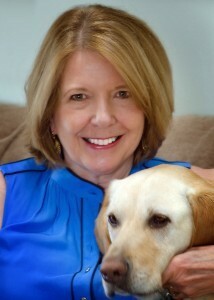 She has published five previous novels, one of which became a Lifetime Original Movie of the Month, two books of poetry, and a children’s book. Her memoir, Where The Trail Grows Faint, won the Riverteeth Literary Nonfiction Book Prize. Born and educated in New England, she and her husband currently live in Ohio with a yellow Lab feared by squirrels in a three state area. I read A Matter of Mercy during a month when I was also attempting to write an produce a podcast every day as part of the Dog Days of Podcasting Challenge, and I have to say, even though emotions run high among the characters, author Lynne Hugo captured the feeling of living on the shore so well, that the novel itself felt restful while I was reading it. The two main characters, Caroline “CiCi” Marcum and Ridley “Rid” Neal are each interesting in their own right, each recovering from a somewhat tumultuous past, and each a little bit cracked around the edges, if not actually broken. Caroline has returned to Wellfleet to see her mother through the older woman’s final days with ovarian cancer. (As someone who watched a dear friend of my mother’s go through just such a disease – there is no cure – those scenes were especially poignant for me). Rid is running the family oyster business. Together, they learn to forgive, to let go, to grab onto something new, and even to find love. What I really loved about these characters, and all the characters in the novel, is that all of them were richly layered. Even Caroline’s mother, whom we see pretty much entirely cloaked by her cancer, is a vibrant soul, and through Caroline’s rememberances we learn about both women. There’s a flash of memory, early on, where Caroline recalls her mother brushing out her hair, as a child. What mother and daughter haven’t had that same experience? Likewise the men in the novel are really dimensional. I’m often frustrated by women who write women characters really well, and then turn all the men into cardboard cutouts, but Lynne Hugo is a master of her craft, and every person we meet, friend or foe, local or summer person, feels like a real person. The novel was, of course, inspired by an actual summerfolk vs. locals lawsuit, as happens wherever people want the shoreline to be more about development, and less about sustainable lifestyles, but while the suit may have been a jumping-off point, it’s clear that Hugo’s work is her very own. I want to add a note, as well about the author herself. When I received the ARC of this novel, directly from the author, she’d included a bunch of promotional bookmarks and postcards, and a really lovely note apologizing for the sending of an ARC! As well, she signed it, which makes it all the more special. Bottom line? This is a wonderful, poignant, novel by an extremely classy woman, and you should waste no time reading it. Don’t let the shoreline setting confuse you; this is a year-round novel. It’s not just for summer reading. Goes well with a raw oyster bar (hello, Ceviche) and a good local microbrew beer.